Keep your tires properly inflated: Did you know that an average of 21% of cars inspected in check lanes in the country have under-inflated tires. Proper inflation costs nothing and is the number one source of reduced gas mileage. Think of how hard you have to work peddling a bicycle with low tires and then imagine how hard your car has to work with them. Replace Dirty Air Filters: When your air filter is clogged with dust, dirt, smoke particles and bugs it chokes off the air and creates a “Rich” gas/air mixture. This means too much gas for the amount of air. This wastes gasoline and causes the engine to lose power. Replacing a clogged air filter can improve gas mileage by as much as 10%. Gas Caps: About 17% of vehicles on the roads have gas caps that are either damaged, loose or missing. This causes 147 million gallons of gas to evaporate every year. Make sure your gas cap is in good condition and secured tightly. 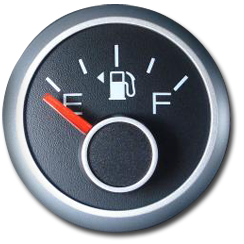 Most current cars require 3-4 clicks to properly tighten the gas cap. Replace Worn O2 Sensor: Inside our cars is a sensor that detects and adjusts the air to fuel mixture, known as the O2 Sensor. When this sensor is worn or defective, it is unable to properly mix this ratio and can significantly impact your car’s mileage and power. Replace Dirty or Substandard Engine Oil: Dirty engine oil increases friction inside the engine. Increased friction makes the engine work harder and that reduces mileage. Replace Worn Spark Plugs: Vehicles have either four, six or eight spark plugs, which fire as many as 3 million times in 1000 miles. This naturally cause lots of heat and electrical and chemical erosion. Dirty spark plugs cause misfiring and inefficient combustion, this in turn wastes fuel saving gas. Don’t be an aggressive driver: Aggressive driving can lower gas mileage by as much as 33 percent on the highway and 5 percent on city streets, which results in 10 to 66 cents per gallon. Avoid excessive idling: Sitting idle gets zero miles per gallon. Letting the vehicle warm up for one to two minutes is sufficient.